2Dept. of Biotechnology, Faculty of Agriculture and Natural Resources, Imam Khomeini International University (IKIU), Qazvin, 34149-16818, IR. of Iran. The regulatory sequence of rice alpha amylase 3D gene (Ramy3D) is amongst the most successful expression systems used for recombinant protein expression in plants. In the current study a 995 bp fragment consisting of Ramy3D promoter and its 5′ untranslated region was amplified from the genomic DNA of an Iranian rice cultivar ″Nemat″, using polymerase chain reaction. The amplified fragment was ligated to the pTG19-T vector and the cloned fragment was sequenced. 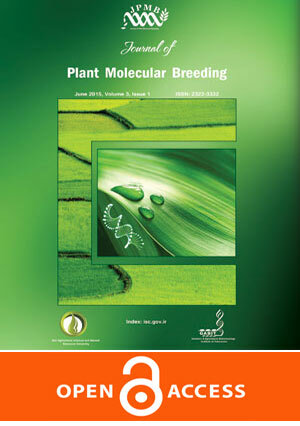 For in silico characterization, the rice specific consensus sequences of TATA-box and YR Rule motifs were scanned against the cloned fragment sequence using FIMO program and the cis acting elements existing in the promoter region were investigated using PlantCare database. A TATA-box motif with the rice specific pattern was identified at upstream position of the transcription start site. The identification of TATA-box in Ramy3D promoter is consistent with its metabolicand tissue specific regulation manner. Several cis regulatory motifs responsible for the metabolic and hormonal regulation of Ramy3D gene were identified including ABRE, G-Box, GC-box, GATA motif and TATCCA T/C motif. In addition several motifs involved in response to various stimuli such as plant hormones, light and biotic and abiotic stresses were identified which include circadian motif, as-2-box, WUN-motif, TGACG-motif, Skn-1 motif, O2-site, MBS, LAMP-element, I-box, HSE, GCC Box, GATT motif, CGTCA-motif and GAG-motif.if.